Do you routinely move goods to or from the USA/Japan/China/India? An EU QUALITY MARK to indicate to your customers and suppliers that your company’s role in an international supply chain is SECURE. The introduction of AEO status is the EU’s response to the need to secure international supply chains. 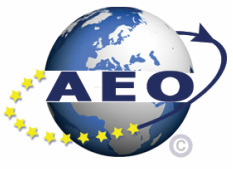 Designed to fit with Customs-Trade Partnership Against Terrorism (C-TPAT) in the USA and other 3rd countries operating under a Mutual Recognition agreement, AEO is based on, and is compatible with, the World Customs Organisation’s SAFE Framework of Standards which is being implemented by Customs authorities across the globe. The Customs Practice regret that the AEO event planned for 10 July is postponed. We are, however, offering individual AEO consultations during the next few months – for further details please call us on 01635 521624.